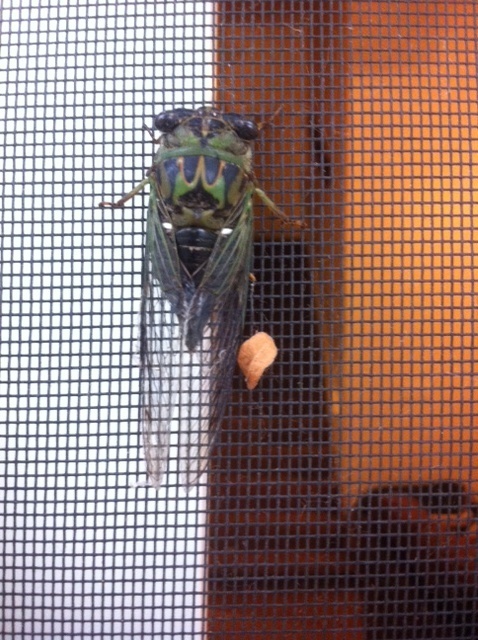 This was on the back screen door earlier in the fall. I will be trying to take a stab at keeping them this upcoming summer. I however won't be breeding them since I know they are in the ground for 17 yeas I believe it was? No I don't like the idea of eating bugs. lol If I kept one I would probably keep it in the old shed. If I had that thing in my room at night and it made the kind of noise they do while I was sleeping, I would have a heart attack. @T.C. wrote: I will be trying to take a stab at keeping them this upcoming summer. I however won't be breeding them since I know they are in the ground for 17 yeas I believe it was? You know they are very short lived and feed on tree sap, right? It would be very hard to keep the adults well fed, you'd need a live tree for them to feed on, and not just any tree would work, you'd need to find out what specific species of tree they feed on and use one of those, and they are so short lived anyway so I really see no reason to keep them lol, (unless you were interested in breeding them, but like you said the nymphs take forever to mature, and need a live tree to feed on as well!). Yeah, five to six weeks is about the maximum lifespan of the adults, which is very short compared to their long nymphal lifespan. Some of the smaller species have very short nymphal stages (1-2 years). You may be able to get adults of any species to feed on sugar water, but that may be a stretch.